Allied Systems Company, parent company for Wagner Logstackers, has developed the New Generation design for its iconic Logstacker, retaining the durability that Wagner is known for worldwide, while introducing new features that make it faster and more cost effective than ever. Wagner purpose-built Logstackers move more logs at a lower price than any other machine on the market. The New Generation Logstackers retain the build quality of older machines, while introducing new features to make maintenance easier than ever. Service technicians can perform routine maintenance quickly and safely from a standing position at the ground level service bay. 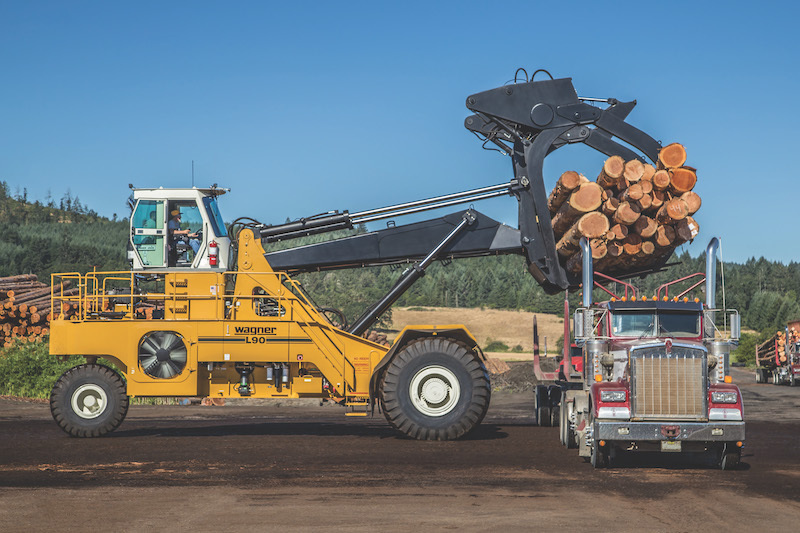 The spacious cab on the Wagner Logstacker sits up higher and further back than cabs on Big Wheel Loaders, providing near 360 degree visibility, and keeping the operator safely away from the load and out of harm’s way. Liquid fire suppression is designed into the chassis with optional automatic fire detection available. Getting on and off of the machine is easy with lighted stairways on both sides of the machine and clear walkways all around. And now, with optional eco-friendly hydraulic oil and a leak-free hydraulic design, the Wagner can be operated in environmentally sensitive areas without concern. Cost conscious equipment owners owe it to their bottom line to check out these New Generation Logstackers. Simply the most productive and lowest cost to operate purpose built log handling machine on the market.